Here at Planet Granite, we are passionate about climbing, community, and like you, our members, we care about doing good in the world. That passion is at the core of our $1/member per month charitable giving, and it’s why we’ve contributed more than $80,000 to Outward Bound in the last five years, supporting their work of bringing underserved youth climbing and exploring outdoors. Planet Graniteers! You rock! Together with donors around the country, you raised more than $35,439 in donations for the American Safe Climbing Association’s mission of bolt replacement. Every November for over 10 years, Planet Granite has hosted an exciting HelpHopeLive benefit (in honor of Stacey Collver) called the Mt. Everest Climb-a-thon. The 2015 Mt. Everest Climb-a-thon is coming up on Sunday, Nov. 1, 2015, from 12:30-4:30 pm. After obtaining sponsors climbers arrive at the event at PG Sunnyvale on Nov. 1, determined to climb as many vertical feet as possible in three hours. Afterwards, all the scores will be added together to see if everyone can climb 29,035 feet, the height of Mt. Everest! Those who raise over $100 will receive a T-shirt. To participate, you can either climb on-site this day, or make a donation and be a “virtual climber.” (Each dollar donated=one vertical foot.) 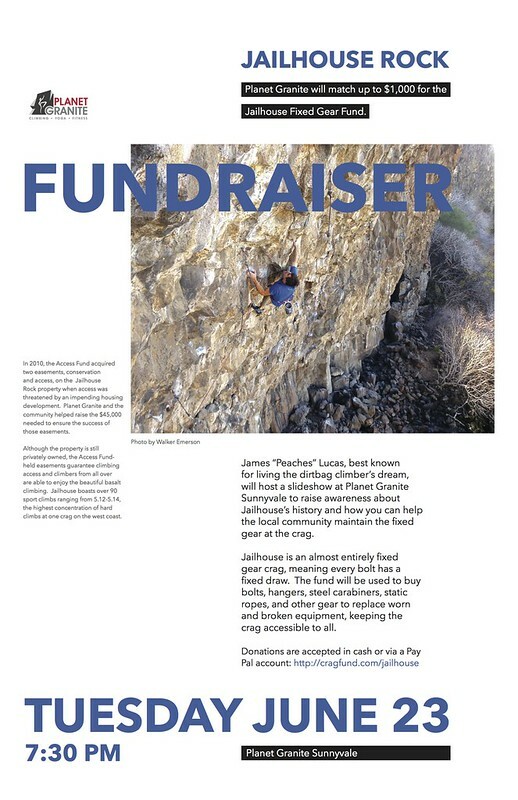 You can also support a friend by sponsoring their climbing. The suggested donation is $25, but additional funds are very much appreciated. The funds are used to offset Stacey’s medical expenses, which are over $1,000/month. Donations are tax-deductible, and some employers will even match your charitable donation. 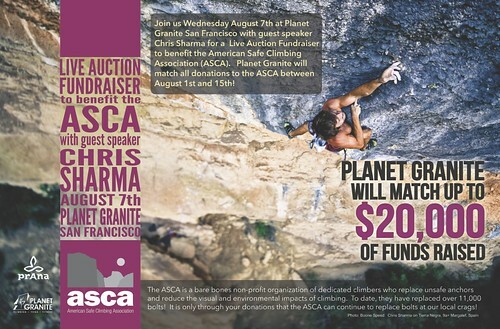 We’re one week into October, that glorious month when summer temperatures make way for climbing climes, when playoff baseball is on the tube, and when Planet Granite will double your money when you contribute to the American Safe Climbing Association. Correction to newsletter! Jailhouse Rock Fundraiser will be at PG SUNNYVALE! And all donations at this event will benefit Jailhouse Rock’s Fixed Gear Fund! ASCA Live Auction Fundraiser is this Wednesday – Sneak peek of some of our auction items! !